Stratégie : ARC CRO ou ARC presta, quelle est la différence/l’avantage? Cas d’étude : Catastrophe! Le consentement éclairé est perdu, que faire? Je ne trouve pas de boulot d’ARC, je suis stressée, que faire? 8ème journée de la recherche clinique, 31 janvier 2019, l’événement à ne pas rater, “The place to be”! Je veux vraiment devenir ARC, j’ai été recalé au Master de recherche clinique, Que faire? Imminent…Le mémento sur les recherches impliquant la personne humaine portant sur un médicament arrive! Pharmaspecific recherche un stagiaire ARC/Chef de projet clinique! 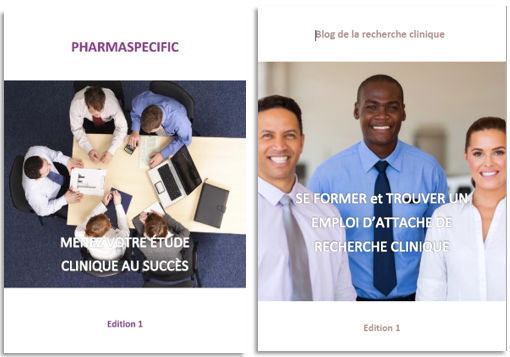 Pharmaspecific training est officiellement ouvert! Bonne nouvelle, le nouveau site est dans les starting-blocks! Pharmaspecific recherche un chef de projet expérimenté en IDF, mission dans le 92! Les étiquettes de médicaments, comment vérifier leur contenu ? VLOG : Connais tu le SOCRA? On t’y emmène. Quel niveau d’études est nécessaire pour devenir ARC ? NOUS RECHERCHONS TEC ONCO A TOULOUSE A PARTIR D’AOUT/SEPT17! Un MSL accepte de répondre à nos questions ! Devenir ARC : est-ce-que je dois choisir l’apprentissage ou bien le stage ? Les entretiens pour le stage d’ARC/Chef de projet sont toujours en cours, envoyez nous votre CV! To us 2017, Happy New Year to all! Congratulations to the winner of the Crazy Pic! Monitoring at the pharmacy, the pillars of success! I cannot organize my workflow, how do I? Moving from CSC to CRO CRA, is it possible? Zen CRA, how to improve your well-being at work? How to become a CRA without training? How to attract promoters and CROs? Clinical site coordinator, how to avoid protocol deviations in my center? I crumble under the mails, how to get out alive? This is hell, I resume my colleague’s studies! Help, I have a consent to monitor! Hospital CSC or CRO CSC ? The ALCOA, ALCO … WHAT? Are you freelance? Collaborate with Pharmaspecific! How to choose a provider in clinical research? I need a helping hand!!! View the 2nd edition of the free eBook Mosio! We participated in drafting!! How to improve recognition of the CSC profession? How to succeed your implementation visit? Why are CROs reluctant to hire hospital CRAs ? It is decided, I am going to Africa! How the transverse management will change your CRA and CSC work? I am co-author of a clinical research memento, come help us! How to prepare an audit without stress? Medical Science Liaison, a conversion for the CRAs? Invalidation of Safe Harbor, what to do? How to organize yourself when you are a “home-based” CRA? You are CRA and / or PM, how to get a pay raise? School and activities start again soon … it is time to apply! The Cooperator Groups in Oncology (CGO): who are they? Your study : BMR or routine care? What do investigators expect from CRA and Site Study Coordinator? 10 essential tools for a monitoring of quality! Clinical research and medical devices, how to go about it? Project manager and CRA manager, let’s explain the words! CRA and SSC, how to choose the right position? The risk-based monitoring: a new method for quality control? Clinical trials insurance, how to choose it well? The MR-001, what is it and how to respect it? Small CROs, where to find them to apply? Keys for a successful closure visit! How to use LinkedIn, Viadeo and Twitter to find a CRA position? How to succeed in reconciling personal and professional life when one is CRA monitor? “I’ve made up my mind, I will go to England”: interview of an expatriate CRA. The patient reimbursement: who is charge and how does it work? What changes to the CRA and SSC profession in France in 10 years? How to communicate effectively with his investigator, his SSC and pharmacist? Hospital single contract: real benefit to the French clinical research?